Pure Beeswax produces a candle that burns longer and cleaner than ordinary wax candles. Slight characteristic scent. Small easy to use yellow pastilles. Uses: Pure Beeswax produces a candle that burns longer and cleaner than ordinary wax candles. 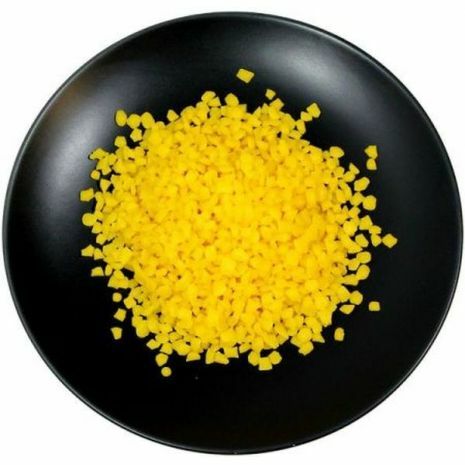 Small, easy to use granules, easy to measure, melts quickly.. Details: Easy to use, great for candles. Granular Beeswax is easier to work with then our Beeswax Blocks, great for makers of cosmetics and soap. Burns Cleaner and Longer then petroleum based waxes. 146 degree melting point. Uses: Beeswax can be used in the manufacturing of many products such as lotions, creams, balms, body butter and even soaps to which it provides body and stiffness and assists as a thickener. Beeswax does not become rancid and can help increase the durability of soap by increasing its hardness. Beeswax is a 100% natural fuel created by bees whereas Paraffin is a toxic byproduct of the oil industry. Beeswax candles burn cleaner than any other, Paraffin candles give off many of the same toxic fumes as are found in auto exhaust. Beeswax candles burn longer than others and do not drip, Paraffin candles are relatively short burning and drip excessively. Beeswax candles emit bright light that has the same light spectrum as the sun, Paraffin candles produce a disorganized light spectrum very similar to old-fashioned incandescent bulbs. Beeswax candles emit negative ions that actually clean the air and invigorate the body, Paraffin candles produce toxic petrol-soot that eventually stains all interior surfaces. Beeswax candles are naturally scented by the honey and nectar of flowers packed into the honeycomb within the beehive. Paraffin candles typically contain artificial fragrances and colors which also produce toxins and stains when burned. Beeswax candles come from a renewable resource: beeswax which is being farmed and renewed naturally everyday. Paraffin candles come from a nonrenewable resource: petroleum. Caution: The melting point of this wax is between 143 deg F to 152 deg F. Overheating this beeswax will impact its scent and color. Please melt beeswax as slowly as possible while stirring gently. Use it as soon as it is melted, otherwise it will cook and render poor-quality results, including a cooked or burnt odor, and an off-white color.